Every day millions of photos are uploaded and shared on the social media. Facebook is unreal and has more than 350 million photos uploaded every day on average. Instagram is getting crazy with an average of 60 million, then there is Flickr, Pinterest, Google +, Twitter. . . But most important they are in a space that is out of your control. It’s great to have a diary with your daily life and photos but it could be gone tomorrow! I know, that’s crazy! Everything disappearing in a click of a finger. A part of your story will be missing! And this is pretty sad. One thing I always enjoy is going through old photos when I am at my parents’ house. They are always there in some big albums, in several shoes boxes and no matter if there is internet or not, electricity or not, they are there in my hands. I said already I am guilty myself of not printing enough! 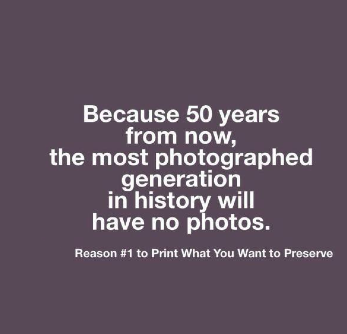 I’d love to have all my photos printed but we take so many pictures nowadays that it’s impossible! I do print the images that I love and want to see often and I print albums to create stories. With my job I sell digital files too but most of the times together with a product, with a beautiful album or a wall piece so people can have them no matter what. I always tell my clients to make a duplicate of the USB I provide them because it’s not archival. Prints, albums and frames are forever! I hope you enjoy this little video. How I create something that last and that parents can enjoy. That’s another reason why I love my job.